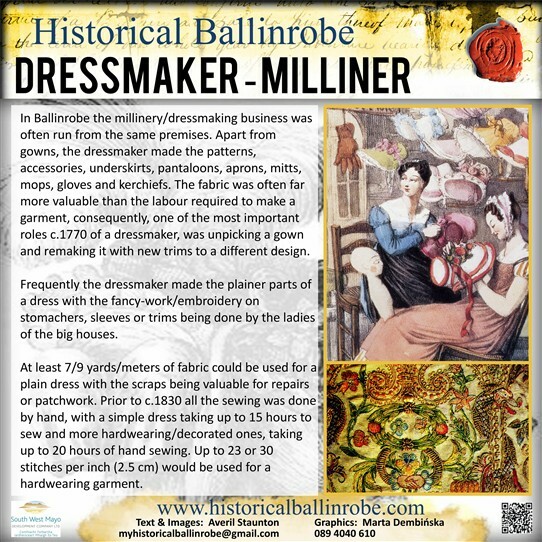 In Ballinrobe the millinery/dressmaking business was often run from the same premises. Apart from gowns, the dressmaker made the patterns, accessories, underskirts, pantaloons, aprons, mitts, mops, gloves and kerchiefs. The fabric was often far more valuable than the labour required to make a garment, consequently, one of the most important roles c.1770 of a dressmaker, was unpicking a gown and remaking it with new trims to a different design. Frequently the dressmaker made the plainer parts of a dress with the fancy-work/embroidery on stomachers, sleeves or trims being done by the ladies of the big houses. At least 7/9 yards/meters of fabric could be used for a plain dress with the scraps being valuable for repairs or patchwork. Prior to c.1830 all the sewing was done by hand, with a simple dress taking up to 15 hours to sew and more hardwearing/decorated ones, taking up to 20 hours of hand sewing. Up to 23 or 30 stitches per inch (2.5 cm) would be used for a hardwearing garment. This page was added by Averil Staunton on 24/02/2014. Delia Flannery from Kilkeeran had a dressmaking business for many years in High Street. Her 'shop' was well known from a famous postcard showing two large metal signs advertising 'Wills Wild Woodbines',one each side of the street door.